The Neo-Pure WPP-25098-10 Surfactant Free Polypropylene String Wound Filter is a cost-effective alternative to other FCPX style filters. This filter not only meets USP Class VI Biological Tests for Plastics, but also is made in the USA. 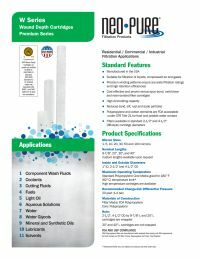 The Neo-Pure Surfactant Free Polypropylene String Wound Filters ensure reduction of sand, silt, rust, dirt, and scale particles. This NSF filter delivers high quality filtration for many applications such as SDI, Reverse Osmosis, and CDI.